I like that we have so many options when it comes to the kind of flowers that are embedded in the paper. Really truly satisfied with my time using Custom Earth promos. We use these seed paper tags to label all our material at the nursery homes. Just another good incentive for purchasers. Thanks for the eco-friendly and custom made products. Great reliable company to do business with. 5/5 star review from me to them for sure. We use these seed paper tags to label all our material at the nursery, just another good incentive for purchasers. My clients at my clothing boutique love the premise behind the seed paper tags. When I explain to them that they can be planted, they are very impressed. We love these seed paper tags, and wouldn't use anything else going forward. Great, reliable company to work with. They get my stamp of approval for sure. I like that we have so many options when it comes to the kind of flowers that are embedded in the paper. Great idea for promoting my products and being environmentally sound at the same time. Custom Earth Promos is vastly superior to any other company Ive worked with in the past. A wide spectrum of design options makes for an easy purchase. Being eco-friendly at the same time is awesome. Customers love the idea of being able to plant the merchandising tags. Creating my seed paper tags was really a cool experience. Helping my marketing and the environment at the same time is really fulfilling. These seed paper product tags are a great idea. I own an antique shop and I thought labeling my merchandise with these seed paper tags was a nice added bonus. We were very impressed with the finished product. A great addition to our company continuing to become more and more eco-friendly. We strictly only purchase eco-friendly. It was refreshing to personalize these seed paper product tags, and compliment our totally organic, earth-friendly store environment. I was able to create some really cute tags, and the concept of being to plant them is neat. As a small store owner and someone who is constantly trying to improve my earth-friendly awareness, these seed paper tags are a perfect fit. I use these seed paper tags for everything I sell at the farmers market I attend weekly. A best seller among our retail and specialty customers, Seed Paper Product Tags are a memorable way to showcase green products or publicize eco-friendly initiatives. 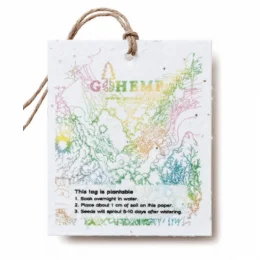 Attach an "earthy" ribbon of hemp string to secure the tag to your product for an eco-elegant presentation that's both affordable and environmentally ethical. The 2.5" W x 3" H seed paper tags can be imprinted on one or both sides, providing optimal space to include product information, brand logo, tagline, eco-friendly fact or initiative. 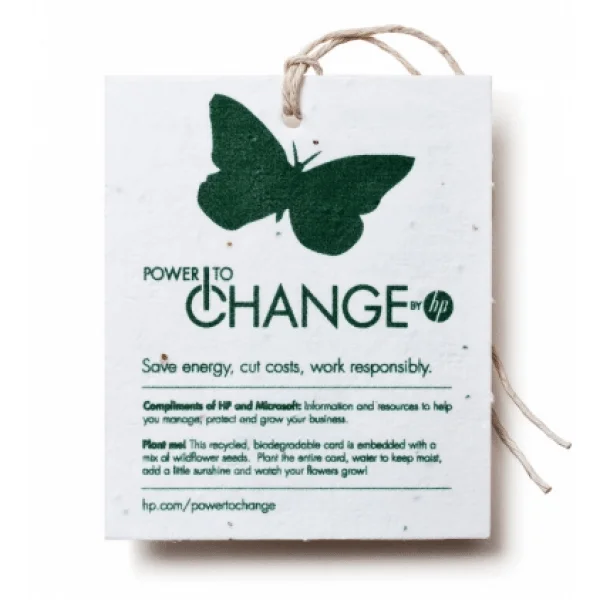 Encourage customers to join you in the fight for a sustainable future by planting their seed paper under a thin layer of soil after the tag has been removed from their product. The infused seeds will sprout into a wildflower garden within just 1-3 weeks. Customize tags with a wealth of available options, including cellophane wrap, eyelets, and ribbons. Custom Earth Promos offers four printing options, with techniques designed to render specific aesthetics without affecting seed integrity. Our seed paper is the best in the industry, with the highest germination rates and exquisite quality. Give your customers a bonus gift with their product purchases with Seed Paper Product Tags that will grow into beautiful living reminders of your eco-responsible brand. Looking for eco-friendly promotional tags to sell your products? The collection of Seed Paper Product Tags from Custom Earth Promos provides an excellent option, with the adaptability to match your specific brand and 100% recycled construction you'll be proud to have representing your brand. Customers will be more than impressed with your green initiative and with seed paper, an initiative will grow into a beautiful, living reminder of your eco-responsible brand. Instead of just throwing them away, customers plant the entire seed paper tag. With daily water, a colorful array of wildflowers will grow in just 1-3 weeks, making our seed paper tags much more memorable than your average product tag. When you use these ready-to-grow tags to market your products, you're making a lasting impression on your customers and adding eco-friendly value to your brand. With the Custom Earth Promos innovative range of Seed Paper Product Tags, we invite customers of all industries to fully customize their exclusive design with a brand logo, name, and graphic. You can also add designs and custom messages that you might want to pass on to your customers. This also makes a great place to promote environmentally conscious initiatives that you've integrated into your business. For instance, if your brand has "gone paperless," and has committed to using only recycled paper or recycled materials for day to day operations, you can imprint this fact as a segue to invite customers to join you in the fight for sustainability simply by "planting this tag." Invest in your eco-conscious brand image to attract both consumers and investors with increased brand value, higher market shares, and increased long-term profitability. Every product that leaves our facility is stringently tested and confirmed as California Proposition 65 compliant, guaranteed to be free from harmful contaminants like chromium or lead. Customize your exclusive order of Seed Paper Product Tags with bold, brand images and meaningful messages. Our high-resolution printing methods ensure that your brand name and logo are shown distinctly on each and every tag. We offer four printing methods including inkjet, digital, offset, and letterpress. A member of our in-house design team will work with you to determine the right printing method for your specific imprint, dependent on potential time restraints and the specific aesthetic appeal your design blueprint calls for. A testament to Custom Earth Promos' all natural philosophy, seed paper tags are derived entirely from recycled materials in an eco-conscious production process that eliminates eco-impact. Only all natural, vegetable-based pigments are used to dye our seed paper and render our imprints. This guarantees no damage will come to the seeds or soil, as well as ensuring customers are protected from any potentially hazardous dyes. Our seed paper is carefully crafted by hand using 100% post-consumer recycled paper, which is then embedded with only USDA-approved, non-GMO, top quality wildflower seeds to ensure the highest possible rate of successful germination. Seed paper is manufactured in the USA at our 30 kW solar-powered facility. Our Seed Paper Product Tags are infused with a diverse variety of perennial and wildflower seeds, including Siberian wallflower, sweet William pinks, catchfly, spurred snapdragon, English daisy, and black-eyed Susan. 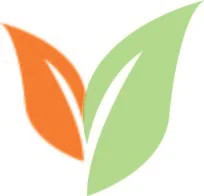 In addition to customizing your seed paper color, our customers can also opt to develop their own exclusive seed mixture with the help of our skilled experts. Our talented team is blooming with new ideas all year round, like our "Hope Mix" of pink perennials and annuals for breast cancer awareness and "Halloween Mix" of pumpkin seeds. Be sure to ask about the creative custom seed mixes we currently have in stock!